If you want to lose weight, improve your physical condition, improve your general health, and even strengthen your mental state, you may want to seriously consider the benefits of Tai Chi. Tai Chi is a form of martial arts. Before you decide that Tai Chi isn’t for you, get the mental pictures of kung fu kicks and breaking boards with Karate chops out of your head. That is not what Tai Chi is about. 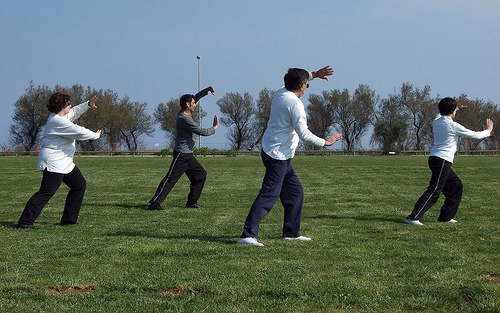 Tai Chi is suitable for all ages, all sexes, and even for all physical conditions. If you are older, overweight, have back problems or other health issues, you can still do Tai Chi, and more importantly, you can still reap the multitude of benefits that come from the practice of Tai Chi as well. Tai Chi improves balance, which is particularly important to you as you age. It can lower your blood pressure and strengthen your heart. It improves your flexibility and strengthens your muscles. It teaches you self defense, even though it is not a violent form of martial arts. Tai Chi is a very peaceful type of martial arts. The moves are gentle and even beautiful to many people. When you spend a couple of hours doing Tai Chi each week, you will find that you are more relaxed, that you sleep better, and that you have more happiness in your life. Many existing health problems will also be vastly improved, if not cured altogether. While going to a martial arts studio that offers Tai Chi is most common, there are other ways to learn this valuable martial art. Many gyms that offer exercise classes are now also offering Tai Chi lessons. Additionally, there are many great videos for beginning Tai Chi that you can purchase. You can even purchase lessons on video over the Internet. Decide what will make you the most comfortable. If you do not feel that you would be comfortable doing the moves in front of a room full of people, go with the DVD or video option, or call your local martial arts studio to see if private lessons are available.